As an owner of a small green industry business there are probably times you wish you could add an extra hour or three to a day. We hear it from our customer all the time. It can be difficult - especially during busy season - to find down time. Especially for businesses with less than a dozen or so employees. Whether it’s irrigation, lawn maintenance or a jack of all trades, when a business of that size starts rapidly gaining more customers and work it pushes their capacity to the limit. So, what can you do? Delegating tasks is a good place to start. This frees you up for some "me time" and can make you a much better owner and manager. Of course, hard work is necessary for creating and growing a successful business but from the owners we’ve come across are much more likely to be on the verge of burning out, than kicking back in the office with their feet up. It all starts with hiring the right people. In order to even have the capable to delegate, you need great employees in the right spots. 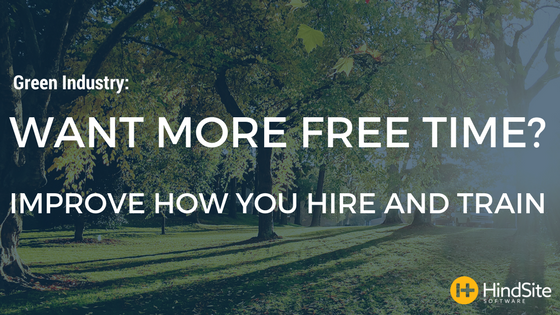 Find people who have skills and values that align with your green industry business. The sources you use impacts the quality of candidates you find - but with the internet there are plenty of solid and accessible options. Take time on the front end to filter through the candidates and interview those with the best credentials, personalities, abilities, interests and drive. Be sure to check references and be thorough in your interview process. It will pay off in the end. Include your current employees in the process. Have a committee of people involved to give you feedback on candidates. Create a formal HR plan to recruit, select, train, develop, retain and reward your employees. There should also be a plan in place for staff turnover. New employees need to be mentored. Mentors can assist the new employee with orientation and assistance getting acclimated to the company. They can answer questions about the job and the job environment. Create a new hire checklist for new employees to refer to the first few weeks of employment to help ensure that new employees understand your basic business procedures. We all know the first few days on a new job can be pretty nerve wracking. Why not help ease some of the nerves and apprehensions? Clearly state the expectations and continue to give new employees helpful feedback. The learning and guidance shouldn’t be limited to only new hires. To create a loyal, well-trained, knowledgeable, ethical staff you need to invest in employee training and development. Employees want and deserve to be set up to succeed; training is part of the formula. People naturally gravitate towards learning. Employees are really concerned about maintaining their skill sets. Training and development empowers them. And this has a direct impact on the connections they make with your customers. It’s your job as the business owner to maintain a commitment to learning and creating a company with a training strategy and a development plan. As small green industry companies build their budgets and plan for the upcoming years, it is critical to continue training for the future and investing in tomorrow. Keep an eye on what is ahead and let your employees know they have a future in your company. Whether it’s training or compensation, find various ways to keep them engaged. Talk to employees about how you see them contributing to your organization and the investment you’re willing to make in them and their success. Now that you have more free time, check out our new marketing guide - Brand on a Budget.